Imotski, is a small town situated on the northern side of the Biokovo Mountain slopes in inland Dalmatian, the area has long been known as a cultural and religious center of Zabiokovlje. It belongs to the Municipality of Zagvozd and Imotski region. Thanks to its location, this picturesque area is an ideal place for a luxury villa holiday including visits to cross-border places such as Medjugorje (57 km or 50 minutes by car). Imotski is far removed from other Holiday Villa Destinations located around the Adriatic sea. One of our lesser tourist locations, Imotski holds a wealth of traditional Dalmatian stone streets with plenty to impress most visitors. 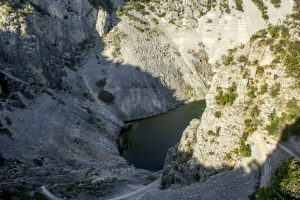 The region is probably most famous for its natural attractions namely, the Modro Jezero (Blue Lake) and the Crveno Jezero (Red Lake). These picturesque Karsts are a natural phenomenon formed in the limestone which surround them. Imotski gives you the chance to get a first-hand view of a traditional Croatian life. Steeped in culture and natural beauty, it makes the perfect location for a Luxury Croatian Villa Holiday. The first traces of settlement in Imotski can be traced back to the Neolithic period, evidenced by archaeological finds. Continuous population of the region followed from the Early Bronze Age (2000th to 1600th BC) when bearers of the Cetina culture lived here. The Illyrian tribe Delmati in the Late Bronze Age built fortified settlements following their defeat by the Romans, Imotski grew with strong urbanization from this. We can see the remains of Roman municipalities near the villages of Runovići and Lovreć. The turning point in the history of this landscape happened under Frankish Empire. Under political influence within the Croatian Principality, Imotski was formed, then called Imota. It ran through the Imotski field, today it’s northwestern half is in Croatia and southeastern in Bosnia and Herzegovina. Following the reign of Croatian-Hungarian kings, in 1493 the Imotski region was conquered by the Ottomans who ruled for 225 years without leaving a deep trace on the landscape. The fall of the Venetian Republic in 1797 continued the change of rulers of Imotski region: Austria, France, Yugoslavia Monarchy, Federal People’s Republic of Yugoslavia. During the Croatian war for independence Imotski was not directly affected by the Serbian aggression, but a large number of its inhabitants fought on all Croatian fronts. Although gastronomy of Dalmatian hinterland is mostly the same across its many different parts, there are some features that distinguish this particular part of region from others. In Imotski that is definitely Studenački cheese, produced from cow’s milk, this is the most famous cheese of the Dalmatian hinterland. As the main starter, there is always a combination of homemade cheese and prosciutto. A speciality of the Dalmatian hinterland. The wealth of delicacies in Imotski town we will show through Sunday lunch across different seasons. Spring plates are full of soup, boiled lamb, tomato salsa, and roast beef with potatoes. In summer the best are boiled or baked chicken or roast lamb and various sauces. During autumn there are stuffed peppers, pork, breaded veal medallions and lettuce. Winter is reserved for a traditional dish, Kaštradina. A dish of dried mutton and lamb, with the addition of rašćika, a descendant of the wild cabbage. In addition to savory dishes, Imotski is also famous for its cakes of almond and walnut. The most famous is the Imotski cake. Packed with almonds, a little flour, maraschino and a range of other ingredients heavily guarded for more than 150 years. Dalmatia is a region of wine. Most Imotski cellars are filled with high-quality bottles from the vineyards of Imotski. Indigenous wine of this region is Kujundžuša, refreshing wine that is the most appropriate with fish and seafood or cheeses and salads. Of white variety. 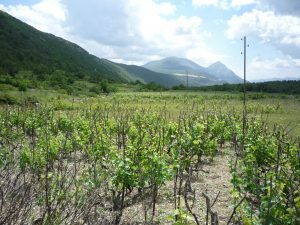 there are Chardonnay, Sauvignon Blanc, Pinot Gris, Pošip and žilavka. A saying of the Imotski area is “what will serve you the most expensive dish, if you have no one who will prepare it.” It is togetherness that is the most valuable thing you can take from this wonderful area of countryside. 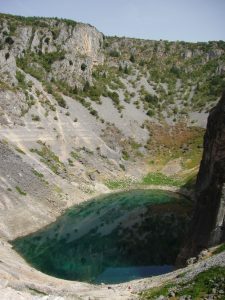 Situated just over one kilometre to the west of Imotski, the red lake is one of the most famous natural attractions in the area. So called due to its red coloured cliff walls which surround each side of the sinkhole, the red lake is the deepest known Karst in Europe. The Blue Lake is so called because of the colour of it’s water, sits on the edge of the town. This is a much more tourist friendly locations being view-able from high on its surrounding cliffs, or by taking the trail down to the water’s edge where you will likely find locals and tourists swimming alongside. The Blue Lake is much larger in size than it’s red companion. According to scientific discovery, it is believed this was once two sinkholes which have since become eroded and merged as time has gone by. In the unlikely event you miss the Adriatic coastline during your stay in the beautiful surroundings of Imotski, the popular tourist destinations of Split Riviera and Makarska Riviera are within easy reach for a day trip. This gives the perfect balance between the coastal riviera attraction and the rural, traditional appeal of Croatia to your luxury villa holiday.